On November 26, don't forget to grab a slice or two of your favorite cake from a local bakery because the National Cake Day is celebrated on this date. Cake is one of the world's favorite desserts. A modern cake is usually a sweet baked dessert though it was originally a type of leavened bread sweetened with honey and fruits. Cakes are usually made with flour, eggs, sugar, and butter or oil. Some cake varieties also require liquid (water or milk) and leavening agents (baking powder or yeast). 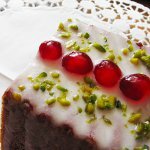 Cakes can be flavored with fruit purées, candied or dried fruit, nuts, extracts, or liqueur, filled with dessert sauces or fruit preserves, decorated with icing, candied fruit, marzipan, or other culinary decorations. There are numerous cake recipes to suit every taste. Cake is often the dessert of choice at wedding receptions, baby showers, anniversary parties, and other ceremonial occasions. A birthday cake is practically a must for any birthday party. Cake is also a popular comfort food dessert. On the National Cake Day, indulge yourself with a piece of any cake type want. It may be a cheesecake (which isn't really a cake, but who cares), fruitcake, coffee cake, red velvet cake, devil's food cake, or any other kind.